A pantry staple that makes a great gift! Ever wonder why dishes typically taste so much better in restaurants? No, it’s not just because you didn’t have to do the shopping, cooking or cleanup…it’s because pro chefs are masterful at layering flavours. Quite often, their dishes benefit from the time they have taken to transform batches of simple ingredients such as olive oil and vinegar by infusing them with herbs or spices. The subtle nuance of extra flavour these enhanced products can add to a dish is really amazing. This year, I decided to experiment with adding fresh herbs and garlic to red wine vinegar, and the result is fantastic. I purchased cute bottles at my local dollar store so now the infused vinegar is all ready for gifting! Divide the fresh herbs among two 500 mL canning jars (or use one large 1 litre jar if you have it). Pour the vinegar over top of the herbs and add the garlic cloves. Cover and let sit for 5 – 8 days, shaking occasionally. Strain the vinegar into a clean glass measuring cup or jug, discarding herbs and garlic. 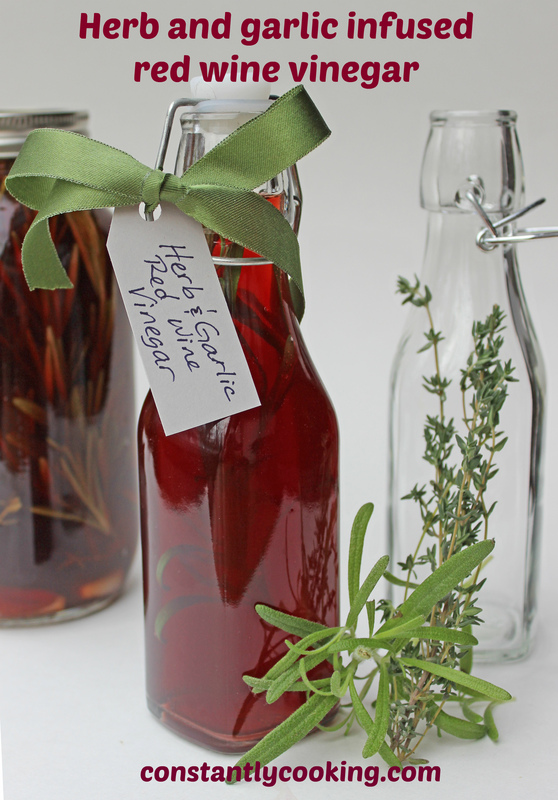 Place a fresh sprig of rosemary in several decorative bottles with tight lids (or use 250 mL canning jars). Pour the strained vinegar over top. 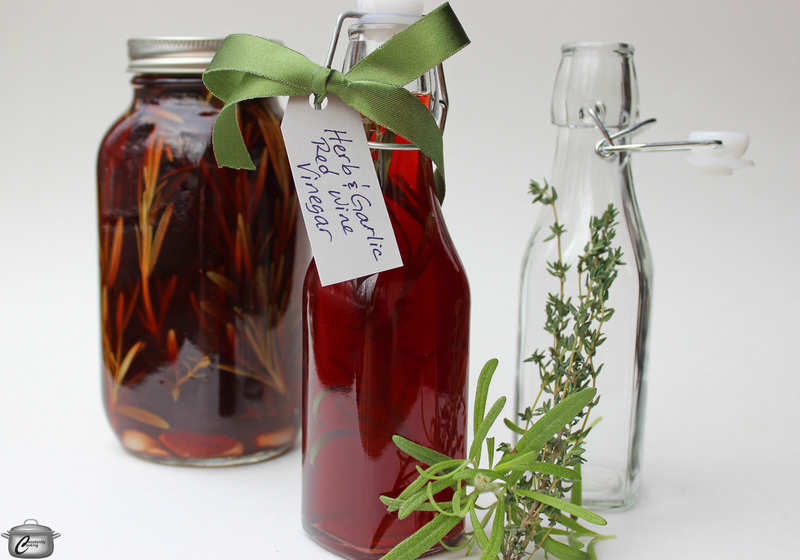 Place lid on bottle or jar, label and your vinegar is ready for gifting. Makes 4 cups / 1 litre. This entry was posted in Edible Gifts and tagged delicious gifts you can make, flavourful vinegar, garlic, gifts from the kitchen, herbs, infused vinegar, Paula Roy, vinegar. Bookmark the permalink.